SOH | What Does SOH Mean? SOH means "Sense of Humor". 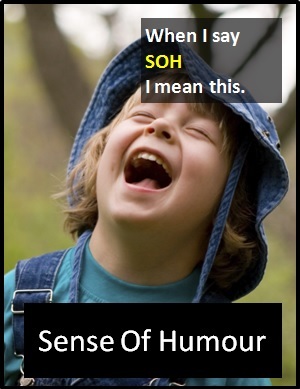 The abbreviation SOH is used with the meaning "Sense Of Humor". SOH is typically used on dating sites to refer to a personal characteristic either possessed by the poster or sought by them in a match. When preceded by the word "Good", "Sense Of Humor" is often abbreviated as GSOH (Good Sense Of Humor). In this context it is typically used by posters to present themselves as witty and entertaining. In fact, a poster's claim that they have an SOH usually offers no clue as to their real ability to be funny. This is the case because almost everyone believes that they have a good "Sense Of Humor", therefore there is no objective reference to measure such a claim against. An SOH helps to see the funny side of things. Ian: You must be mad to put up with him. Colin: It definitely helps to have an SOH. Mark: What are you looking for in a girl? Mel: Considering how I look, she's definitely got to have an SOH. As it is pronounced using its individual letters (i.e., "Ess Oh Aitch"), SOH is classified as an initialism abbreviation. Initialisms are different to acronyms, which are spoken like words. The abbreviation SOH attracts the article "an" because it starts with a vowel sound. However, when spoken or written in full (i.e., "Sense Of Humor"), it attracts the article "a" because it starts with a consonant sound. Dating sites are full of specialist abbreviations, which have their roots in a time when personal ads featured in local newspapers and users were charged by the word. The abbreviation SOH would cost the fee for one word, as opposed to the three words that "Sense of Humor" would cost. Before the digital era, we would have just said "Sense Of Humor" instead of using the abbreviation SOH.